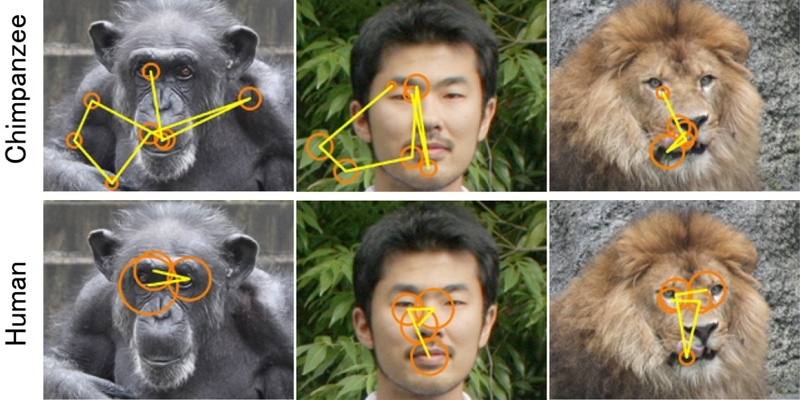 Scientists at the Primate Research Institute at Kyoto University use eye tracking to study chimpanzee face scanning patterns. The Primate Research Institute at Kyoto University has studied the behavior and cognition of non-human primates for several years. By studying mankind's closest relative, Dr. Kano and Dr. Tomonaga at Kyoto University aim to understand emotional expression and detection. They used eye tracking and enlisted the help of the 14 chimpanzees at the Kyoto facility to do so. Unlike previous studies of how non-human primates view faces, this eye tracking study targeted the comparison between chimpanzees and humans with regard to face scanning; the different patterns of scanning, dependence on facial expression, and which factors contribute to the detected patterns' characteristics. Both species have similar facial expressions, but there are still vast differences between the way chimpanzees and humans interact. There are also major differences in the muscular face structure. Where humans make subtle expressions with the eye area, chimpanzees instead possess equivalent motor control and musculature around the mouth. Chimpanzees often move their heads and even leave during experiment sessions! Tobii’s quick and long-lasting system calibration procedure greatly helped in acquiring accurate and reliable recordings of such individuals. 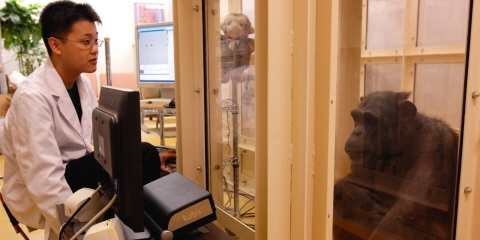 Dr. Kano and Dr. Tomonaga used a Tobii X120 eye tracker to conduct these experiments, collecting accurate eye tracking data without limiting the subjects' freedom of movement. In the first experiment, six chimpanzees and 18 humans (Japanese students) looked at 72 color photos of faces of humans, chimpanzees and other mammals. The tests were divided over ten sessions to keep the chimpanzees motivated, who were rewarded with apple slices for participating. In the second experiment, five chimpanzees and nine humans looked at 24 random photos of human and chimpanzee faces expressing standard human emotions; happiness, excitement, fear, anger, etc. The chimpanzees and the humans were all highly familiar with faces of both species and never responded with fear to the photos. In the application created with Tobii Pro Software Development Kit (SDK), areas of interest (AOI) were defined, dividing the face into sections to further analyze fixations and saccades for these areas. With Tobii Technology’s solution, we are able to acquire eye movement data in chimpanzees as accurately as that in humans (average error of approximately 0.5 degrees). Both species focused more on the face than on any other part of the photo, the eyes being the initial target for both chimpanzees and humans. Secondary fixation was in both cases the mouth, the main difference lying in the fixation duration on the eyes. Humans looked much longer at the eyes than did chimpanzees who quickly moved their gaze to the mouth area. Humans were more likely to re-fixate on the eyes, creating a triangular gaze pattern, whereas chimpanzees were less likely to fixate on the eyes at a later stage. For both species, the main features (eyes, nose, and mouth) were the vital fixations, except in the case of chimpanzees viewing mammal faces where other parts (like the lion's mane or the rhino's horn) attracted more interest. quickly shifted the focus towards the mouth. 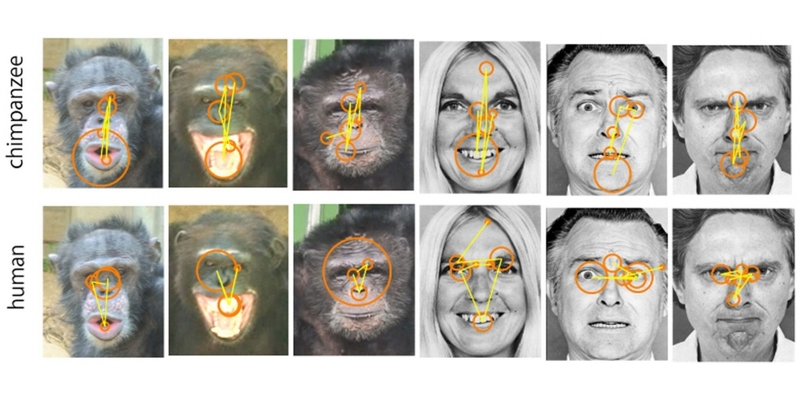 In the second experiment, the researchers found that the chimpanzees altered their gaze patterns depending on the facial expression in front of them, yet with distinct fixation on the mouth. Humans, however, remained intensely focused on the eyes, regardless of facial expression. This would indicate that chimpanzees and humans have very specific facial eye scanning patterns, that are in fact so different that what we today know as human lengthy eye contact interaction would have appeared at a later stage in evolution.